In more than 230 years of statehood, the United States has created its own distinctive way of living and governing--a way which its citizens cherish, but about whose essence, for want of definition, they frequently disagree. Charles Beard offered, in a synthesis of his life work, a permanent statement on the nature of the American Republic. 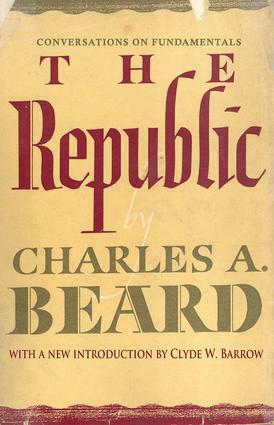 To carry out his purpose, Beard discusses, among other subjects, the making of one nation out of many peoples and nationalities, the letter and the spirit of the Constitution, the rights and liberties of citizens, the theory of checks and balances, the role of political parties, the Republic in the world of nations, and the coming fate and fortune of America. Above all, he deals philosophically with the eternal conflict between power and freedom, security and liberty. In form, the book is a series of conversations among friends. The author and two public-spirited citizens carry the main burden of the discourse, and other figures are introduced to present special but prevailing points of view. In this way the reader not only feels that he is participating in a search for the truth, but discovers that his own point of view has here an able sponsor. Beard has taken a theme of majestic scope and presented it in terms that are warm and human and immediately relevant. We, The People . . . Establish this Constitution . . .